Our quiet cottage Rainbow (45 square meters) is ideal for couples for a comfortable stay. The combined living / sleeping area with dining table, comfortable seating, fireplace and comfortable double bed is upstairs. It has a separate entrance with upstream, terrace and a pleasant floor heating. The partly existing pitched roof and a huge panoramic windows give the house a lot of charm. The Wi-Fi is available in the apartment. A small cot and high chair can be provided free of charge on request. The initial supply of linen (sheets, towels and bath towel, bath mat, tea towel) is included in the price. The open kitchen is fully equipped with ceramic stove, oven, dishwasher, refrigerator, microwave, coffee maker, toaster, kettle and further extensive accessories. The modern bathroom has a shower, wash basin, towel dryer and toilet and has - like the entire apartment, a pleasant floor heating. Welcome to our farmhouse! For a beautiful, restful and relaxing stay: Our farmhouse offers you a generous and cozy holiday home (45 sqm, 2 guests), an exquisite selection of holiday apartments (90 to 100 square meters, 2 bedrooms, 4 guests) all top quality with fireplace, whirlpool, partly. Sauna and a balcony. The Wi-Fi is available to all guests free of charge For recreation to our swimming pool (8m x 12m) can be used with a lawn or barbecue area with fire bowl at any time in the garden! Trampoline, TT - plate or swing for children are also available. On cooler days, a bath can be in the whirlpool, which is part of every holiday apartment may be very tempting - or unwind in our sauna, which is available in two holiday apartments. Very cozy it is in the evening, when you can sit together at the fireplace (possible in all units). In Manor Koldevitz also various massages are offered and executed directly in the holiday apartments. This can be booked by phone already before arrival or locally. The quiet manor is located in the center of the island of Ruegen in the district Garzer Koldevitz. From here you easily reach all major attractions of the island, from the beach on the Baltic Sea is by car about 15 minutes. Particular preference is the position of our farmhouse for all friends and lovers of golf. Just 800 meters away is the golf center lock Karnitz which is beautifully integrated into the beautiful landscape of Ruegen. In addition to a 9 - hole - Short Course (Public Course) there is also an 18 - hole - Champion community space (Challenge Course) available. Likewise, the manor Koldevitz is ideally located for horse lovers and riders. The beautiful equestrian center "Tegelhof" in Sehlen is just 2 km away .The initial set of linen (sheets, towels and bath towel, bath mat, tea towel) is included in the price. More details can be found in the description of the individual units. Our services include also the morning bread and Hol / and return service from Bergen Train Station in An. - or. Departure of guests. Parklätze are plentiful on the property. For you have brought bicycles is a garaging available. Until the bus public transport stop is about 500 meters. We look forward to welcoming you in the manor house as a guest and to invite you to the beautiful island of Rügen, a! Our farmhouse is located very close to nature and quiet in the heart of the island of Ruegen in Koldevitz, a district of Garz auf Rügen. From here you can easily reach all major attractions of the island and the city of Stralsund with the historic city, a UNESCO World Heritage Site. 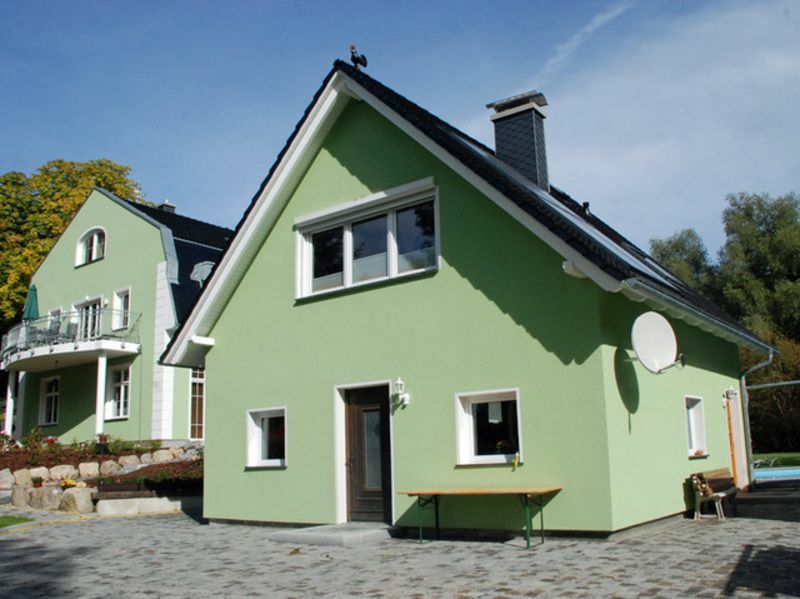 In the immediate vicinity, only 800 m away, the golf course is Karnitz with a 18-hole course. Likewise, the manor Koldevitz is ideally located for horse lovers and riders. The beautiful equestrian center "Tegelhof" in Sehlen is just 2 km away .Zahlreiche biking and hiking trails invite you to explore the surrounding area. Of particular interest is in the neighboring town of Sehlen Gothic church with its hall-like nave and a four-story West Tower. The complete equipment is from the time of construction of the church. These include u. A. Of the altar, the pulpit, baptism and the organ. Shops, restaurants and cafés are in Garz and the nearby county town Bergen (6 km).